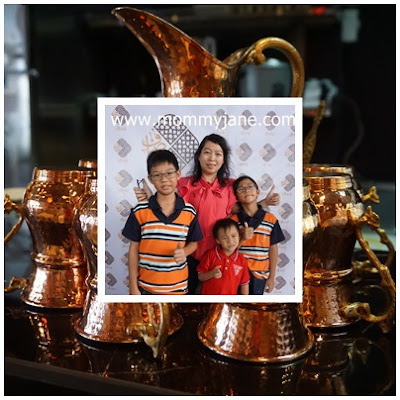 Mommy Jane and Little Angels were invited to joined the launch of Sihaf Arabic Restaurant which located at Shah Alam recently. Sihaf is named after a concept mentioned in the Holy Quran with the meaning of gold trays. The logo of the restaurant represent its name with three curved triangles as three is an auspicious number in Sunnah and also the number of meals in a day as recommended by the Prophet. The traditional pattern that decorate these curved triangles reflect Islamic culture and the colours that are used to acknowledge Islamic nations. By naming their restaurant as Sihaf and choosing the logo, they intend to pay tribute to Islamic concepts and inviting divine blessings from their patrons. The event started with the speech by SIHAF Owner/Founder who had welcomed all of us to the opening of their restaurant. Shawarma is one of the most popular options for most Middle Eastern cuisine lovers. The meat is slow-roasted on a turning spit, lending juiciness and tenderness. It is wrapped up in a laffa with some veggies and sauce to create a little bundle of goodness. Lunch started at around 1.20 p.m. and all the invited guests were treated with sumptuous of Arabic food which is healthy and yet delicious. Some of the Chef are from Arab and they prepared the food on the spot to ensure its freshness. 1 of it which caught my attention is the Sabich. Sabich is the best alternative to pita stuffed concoction. This food is made by first frying eggplant and then combining it with vegetables or hard boiled eggs. It's then doused with tahini and stuffed into pita to make it a great meal. The Arab rice served at Sihaf comes with exotic taste of the saffron with the fluffy basmatic rice which is great to eat it with any main dish. The chicken kabsa is a spiced grilled chicken and is marinated with several spices. The chicken meat was tender and the taste was delicious. Their Lebanese meatballs were done with tons of fresh herbs, spices and tangy goat cheese. Both the meat match perfectly with the rice. The must to eat dessert at Sihaf is their Baklava. Buttery filo pastry, chopped nuts, sweet syrup and honey dressing.The delicious dessert is worth to try it out. Sihaf Arabic Restaurant had a fine dining area which can accommodate more than 100 guests. You can choose to sit inside the air-cond restaurant with the Arabic feel or outdoor area. The best thing is, you can see directly how the Chef prepared your food at their open kitchen concept. Sihaf Arabic Restaurant is located at B-LG-1, Shop Lot Vista Alam, Jalan Ikhtisas, Seksyen 14, 40000 Shah Alam, Selangor Darul Ehsan. Tel : 011-11110500. For more information, do check out their facebook page at www.facebook.com/sihafrestaurant. If you're looking for the true authenticity of Arabic food, then you must give it a try at the newly opened Sihaf Arabic Restaurant. Besides the chicken and if you're lamb or beef lovers, then this place will meet all your cravings for the meat in a healthier and delicious way. Rawlins suka minuman dia dan juga shawarma tu. Tak sempat makan nasi dia tempoh hari. Rawlins, I like their Baklava. Kak Hanny, enjoy your meal there. Syafiera, you so lucky to have a husband who had the same interest with yours. Ivy, do try out their Baklava. Ena, they did it on the spot. Still fresh and hot. Wow, panjangnya kebab tu! Semua makanan nampak menyelerakan, restoran pun cantik. Mesti cuba ni. Maisarah, do enjoy your meal there.